Traverse City, Michigan. Consistently ranked as having some of the state’s best sights, tastes and experiences. But what about the sound? Enter The Accidentals, a musical mosaic of bluegrass, indie folk and rock, packaged in warm, homemade feelings. The band released their first major label record, “Odyssey, in 2017, and will be headlining this year’s Walk the Beat kickoff concert on Albion College’s Quad on Oct. 5 at 7 p.m., ringing in the third edition of the city-wide musical event event. And it’s only fitting. 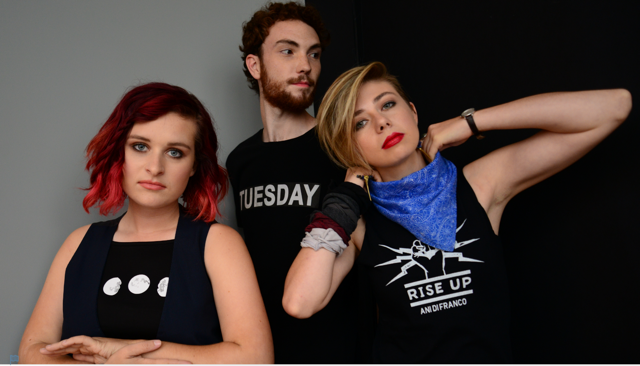 The Accidentals, much like the city of Albion, are very much on the rise, captivating the attentions of fans and music critics alike since their conception seven years ago. Yahoo! Entertainment even named the band one of top 10 bands to watch in 2017. High school friends Katie Larson (vocals/guitar) and Savannah Buist (guitar/violin) met through their after-school alternative orchestra project, where they songs of bands like Led Zeppelin and MGMT. This turned into gigs around coffee shops and bookstores around northern Michigan, and an eventual collaboration with drummer Michael Dause in 2014. As they gained prominence, it became clear that their original name, “Tree Huggers,” would need some retooling. Thus, the term “Accidentals” came into play. The word itself is a reference to music theory. It describes a musical note that doesn’t belong in a key signature, but sounds right in a song regardless. Larson explains that the name was more representative of the band, given that they were experimenting with unorthodox sounds, such as the combination between violin and electric bass. In time, both their name and sound began to stick. Perhaps one of the biggest boosts the band got was the South by Southwest Festival in Austin, Texas. The annual, gargantuan pop culture event features bands from across the nation, all vying for exposure. Many of these bands take a do-it-yourself approach to the event, as they must get to the festival on their own financial terms. The Accidentals did just that in their first trip to Austin. Their efforts paid off. Right before 2017 SXSW Festival SXSW, Texas Lifestyle Magazine named The Accidentals their Must See Pick for the festival. Of course, being a part of a band is a partnership, especially at the up-and-coming level. In regards to the band’s relationship, Larson jokes that it was like her and Buist running a business together while also being part of a marriage. Yet, the group finds a mediative component through it all. So, what’s next for these rising Michigan stars? Aside from an upcoming new album and a European tour, the band will first rock the Albion College Quad on Friday, Oct. 5 at 7 p.m., in an event that celebrates the communities that have inspired their work. On Saturday, Oct. 6, 46 musical acts will play at 23 venues across the city of Albion, from Baldwin Hall at Albion College to Albion Malleable Brewery on Superior Street. Musicians compete for a grand prize that includes studio time at Grand Haven’s Third Coast Recording.